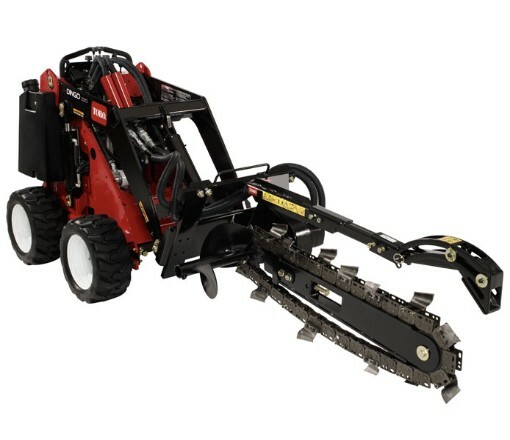 Looking to rent a High Speed Trencher attachment for the Toro Dingo in Rochester NY, Ithaca NY and Western New York? The High Speed Trencher Rental Attachment is high torque and widely respected Tool Rental item. Available in 24 inch and 48 inch booms. Chain Widths = available in 4 inches, 8 inches and 12 inches. Precision engineering includes a reversible boom, chain tensioner, nose roller and the reputable Dingo Hydraulic Drive.